White carrots have a mild, sweet flavour. Cultivars include Snow White, Lunar White, and White Satin ( photo right). 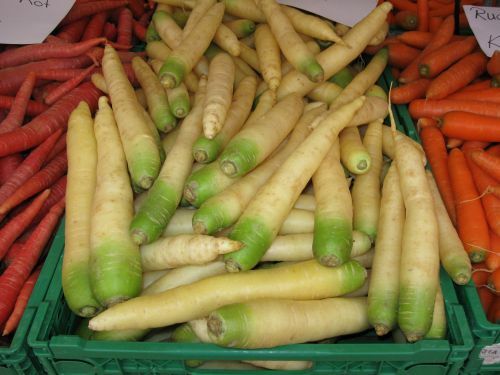 Many people believe that the white carrots found in the speciality stores are "just parsnips", this is not true. 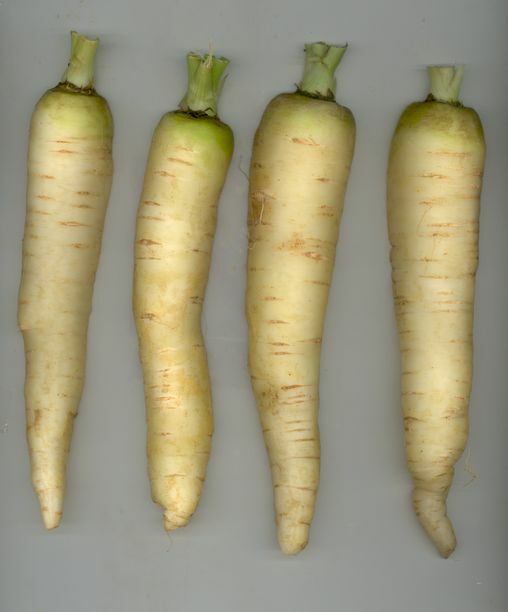 Parsnip is in the carrot family but a separate species. Parsnips tend to have a more golden brown or ivory colour and a more nutty taste, and they tend to be larger. Parsnip is pastinaca sativus. The carrot has traditionally been known as an orange vegetable. Generations of people in the West have grown up believing that carrots have always been orange. 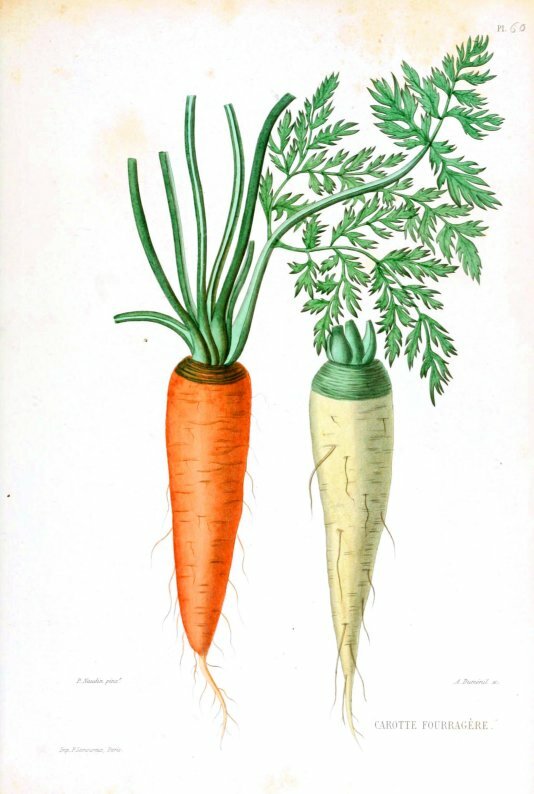 But long before the Orange carrot became established in the 15th century, the white carrot (Daucus carota ssp. sativus) grew in Europe, often fed to cattle but also consumed by humans. Cultivated carrots originated in the Afghanistan region and were yellow and purple. From this center of domestication carrots were grown as a root crop to the East and West with the incorporation of several characteristics contrasting those two geographic regions. The Eastern carrot spread to central and north Asia and then to Japan. Red coloured carrot is typical for India and also was introduced to Japan. 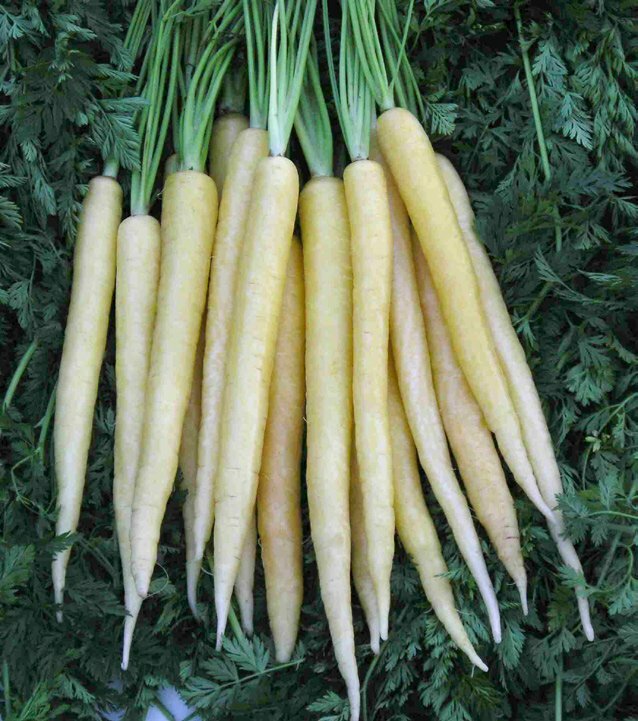 In contrast, Western carrot type is characterized initially by yellow and later by orange root colour. 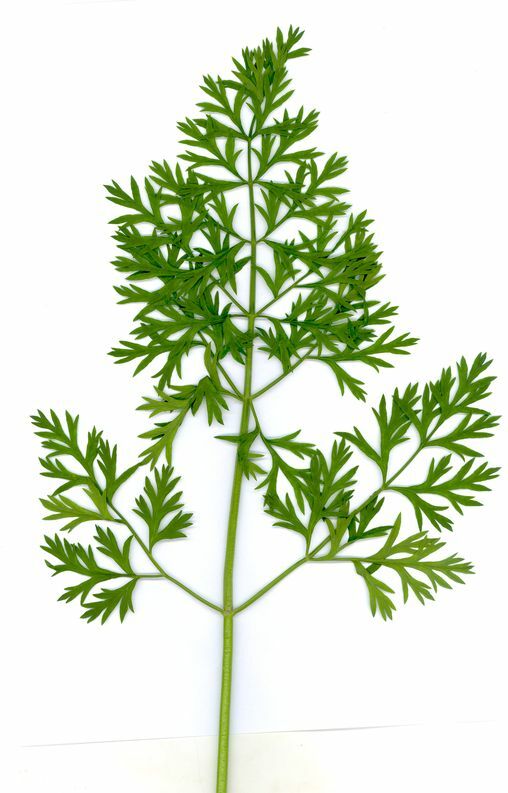 This carrot type spread to West and now dominates in Europe and America. Carrot is rich in pro-healthy antioxidants both of lipophylic (carotenoids) and hydrophilic (phenolic compounds) characters. Although carotenoid content varies considerably among carrot genotypes, usually orange carrots contain high amounts of α- and β- carotene; yellow carrots contain lutein, the red color of carrots is due to lycopene, while polyphenol substances, mostly anthocyanins are typical for purple roots. The colour of yellow, orange and red carrots is the result of certain carotenoid pigments present in the root. These carotenoids can be divided into hydrocarbon pigments or carotenes and oxygenated pigments or xanthophylls. White carrot - White carrots are pigment-free and they contain phytochemicals that work with nutrients and dietary fibre to protect against diseases like colon cancer. The phytochemicals in white carrots can also help reduce the risk of stroke. White carrots are good for carotene allergy sufferers. These varieties are very low in total carotenoid content and lack any pigmentation hence the presence of the white colour. They tend to have a smoother flavour than orange carrots. They do contain naturally occurring, health-promoting substances, called phytochemicals, natural bioactive compounds found in plant foods that work with nutrients and dietary fibre to protect against disease. One might say these are the least healthy of carrots but nevertheless have a rich taste. These chemicals may be important in reducing the risk of atherosclerosis, which is the build up of fatty deposits in artery walls. White carrots are preferably used in baby foods to prevent them from forming orange skin. 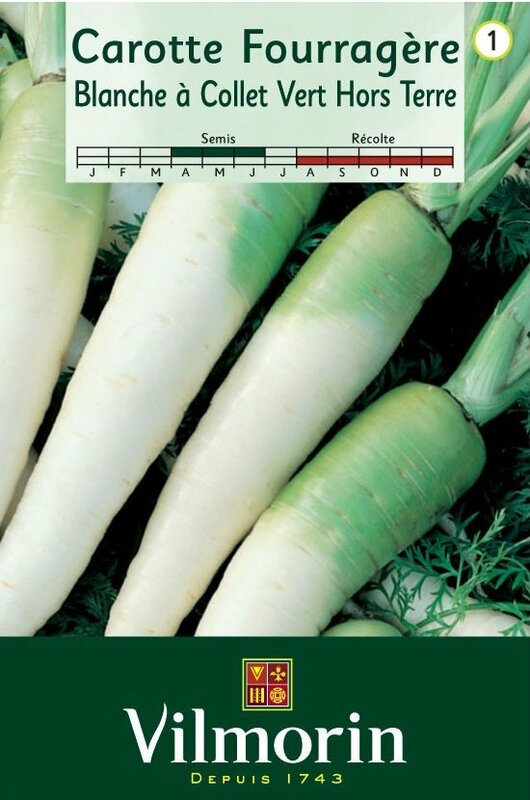 White carrots are not a significant source of bioavailable carotenoids. Historical references to carrot and parsnip are often intertwined; early medieval carrots and parsnips were both thin and woody and mostly of a vaguely whitish colour. This being the case, almost everyone up to the early modern period can perhaps be forgiven for failing to distinguish between the two, however frustrating this may be for the food and agricultural historian. Wild carrot has a small, tough pale fleshed bitter white root; modern domestic carrot has a swollen, juice sweet root, usually orange. Carrots originated in present day Afghanistan about 5000 years ago, probably originally as a purple or yellow root. Nature then took a hand and produced mutants and natural hybrids, crossing both with cultivated and wild varieties. It is considered that purple/yellow carrots were then taken westwards where orange varieties were developed from yellow ones. Finally some motivated Dutch growers took these mutant orange carrots under their horticultural wings and developed them to be sweeter and more practical. White carrots, which were the most prevalent in Europe until the 16th century were superseded by the better tasting orange variety. Before that they were predominantly grown as animal fodder and only occasionally as human food. In Roman times carrots were purple or white. By the 10th century purple carrots were grown in Afghanistan, Pakistan and northern Iran. Purple, white and yellow carrots were imported to southern Europe in the 14th century. Black, red and white carrots were also grown. Though the white carrot is considered as having the least health benefits due to lack of pigment, the other compounds like phytochemicals in these carrots can help reduce the risk of cancer and stroke. Also the dietary fibre in these carrots help fight against colon cancer. 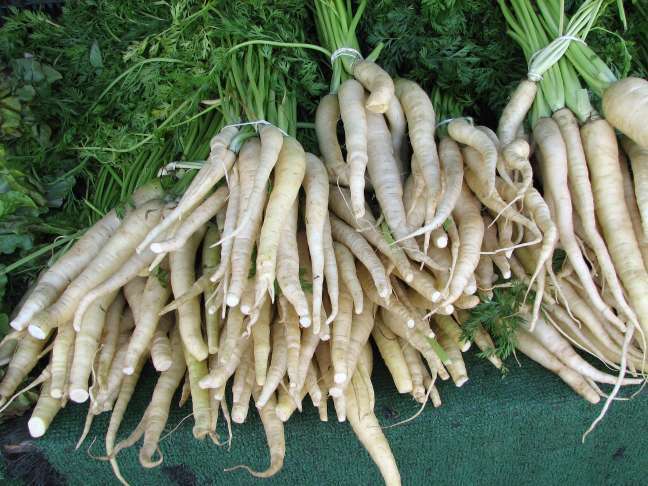 The white carrot is a solution for people who have a carotene-allergy. They are as tasty as orange carrots, but white carrots look less attractive. White carrots are also good for digestion. They are a good alternative to the "traditional" orange colour. Carrots were originally white (and purple) and from Afghanistan before they cross bred to get the orange colour. They have phytochemicals which occur naturally in the plant to help with nutrients in our body and help prevent disease. White carrots are said to be sweeter and juicer than orange carrots. 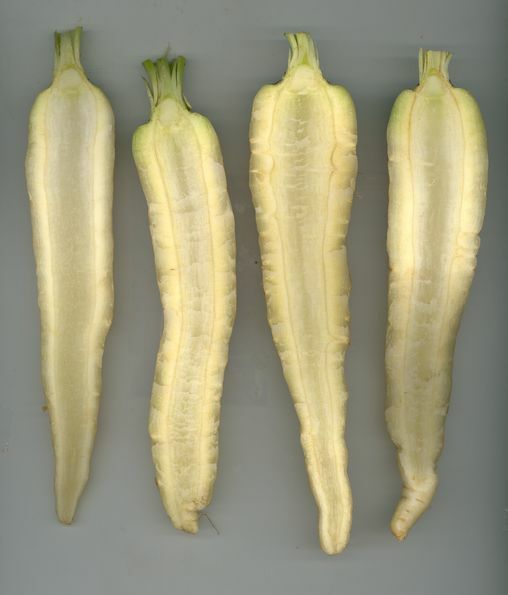 White carrots are not "novelty" carrots genetically modified to produce this effect. They are good sources of dietary fibre and good for carotene allergy sufferers. 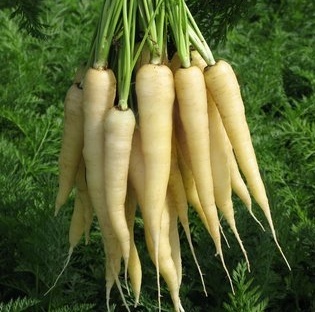 White carrots are other delicious and interesting variety of the carrot species. The taste of white carrots is similar to that of orange carrots, however are often to be slightly sweeter than the orange variety. They can be purchased mine at an Asian food speciality shop. To begin this recipe you will first need to wash and rinse your white carrots under cold running tap water. Next take out your juice machine and plug it in. Next place a tall glass under your juice spout, and then turn on the machine. You are now ready to begin feeding your fresh produce through the machine. Once your glass is full of white carrot juice, turn off your machine, and then give your juice a couple of quick stirs using a swizzle stick. Garnish your juice with a freshly cut lime wedge. White Carrot Soup Summary: A creamy white soup with a surprising carrot taste – strangely addictive! Ingredients: Bunch of white carrots around 6 decent sized carrots), diced, 2 Leeks, sliced, 1 Stick celery, sliced, Pinch dried thyme, 1/2 Clove Garlic, finely sliced, Chicken stock, Salt and pepper to season. Method 1.Begin by sweating off the vegetables in a little olive oil for 5 minutes before pouring in 750ml of chicken stock and adding the thyme. 2.Simmer for 20 minutes until all of the vegetables are soft, then whizz in a blender until smooth. 3.Add the honey and double cream and stir well. 4.If too thick thin with water to the desired consistency then season to taste. Variations Some variations on the net use Gruyere Cheese as an addition which sounds delicious. Read more about all the other carrot colours here. Journal of Agricultural and Food Chemistry; Anthocyanin Composition Of Black Carrot (Daucus Carota Ssp. Sativus Var. Atrorubens Alef.) Cultivars Antonina, Beta Sweet, Deep Purple, And Purple Haze; E.C. Montilla, et al. Journal of Agricultural and Food Chemistry; Color And Antioxidant Properties Of Cyanidin-based Anthocyanin Pigments; F.C. Stintzing, et al. Journal of Agricultural and Food Chemistry; Protective Effects Of Anthocyanins Against Amyloid Β-peptide-induced Damage In Neuro-2A Cells; P.H. Shih, et al. Molecular Nutrition and Food Research; Anthocyanin-rich Extracts Suppress The DNA-damaging Effects Of Topoisomerase Poisons In Human Colon Cancer Cells; M. Esselen, et al.